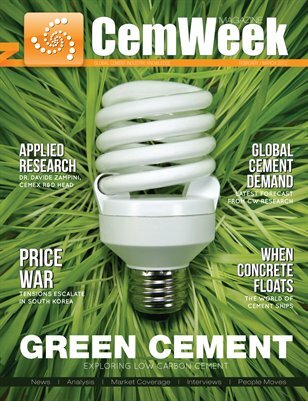 With 2011 over, CemWeek is pleased to look ahead at the innovations and new products set to shape the future of the cement industry. Issue 7 delineates new research into alkali-activated cement, a promising low carbon competitor, discusses intellectual property and product innovation with Dr. Davide Zampini of Cemex’s R&D Center, and provides a buoyant feature on concrete’s seafaring heydays, considering another way that old technology can be made new. Finally, the 2011 numbers are in, and CemWeek presents the research on global earnings and trade prices.